"Research at the Institute of Molecular Biology and Biotechnology published today in the scientific journal Cell Reports reveals the dendritic mechanisms that underlie the storage of associative memories in the brain as well as how such memories become linked across time. The question of how memories are organized in our brains is one of the biggest quests in neuroscience. It has recently received renewed focus thanks to the advent of technology that allows the detailed monitoring of brain cells during memory tasks. Memories are believed to be imprinted in the brain as engrams, which consist of changes in the synapses between neurons as well as changes in the neurons themselves. The molecular mechanisms that mediate these changes are active not only at the time when a memory is being acquired, but long after, allowing memories to interact with each other. For example, it was recently found that the storage of a memory in a population of neurons primes these neurons to capture a second memory if learnt within a period of hours. However, the sub-cellular mechanisms that enable such memory interactions and the structural features of learned memories remain unknown. IMBB researcher Dr. George Kastellakis in the lab of Dr. Panayiota Poirazi developed an elaborate, biophysically constrained neuronal network model that, for the first time, examines how memory engrams of multiple memories are structured in overlapping populations of neurons. The model predicts that active mechanisms within neuronal dendrites promote the clustering of synaptic connections and serve as key players in the formation of linked memory engrams. Specifically, the properties of memory engrams are predicted to depend on the location of protein synthesis in the neuron. For example, when proteins are synthesized at the neuronal soma, the population of neurons that comprise the engram is sparser. Moreover, dendritic subunits promote the creation of synaptic "clusters", i.e. synapses tend to create groups instead of being evenly spread out in the neuronal surface, providing a novel candidate mechanism for information linking at the sub-cellular level. Protein synthesis also affects the interaction between multiple memories at both cellular and sub-cellular levels, for both weak and strong memories. The main conclusion of the study is that memory linking is achieved via their storage in overlapping neuronal populations, whereby they form clusters of synapses within common dendritic branches. As a result, synapse clustering is proposed as a key mechanism for the creation of memory episodes. 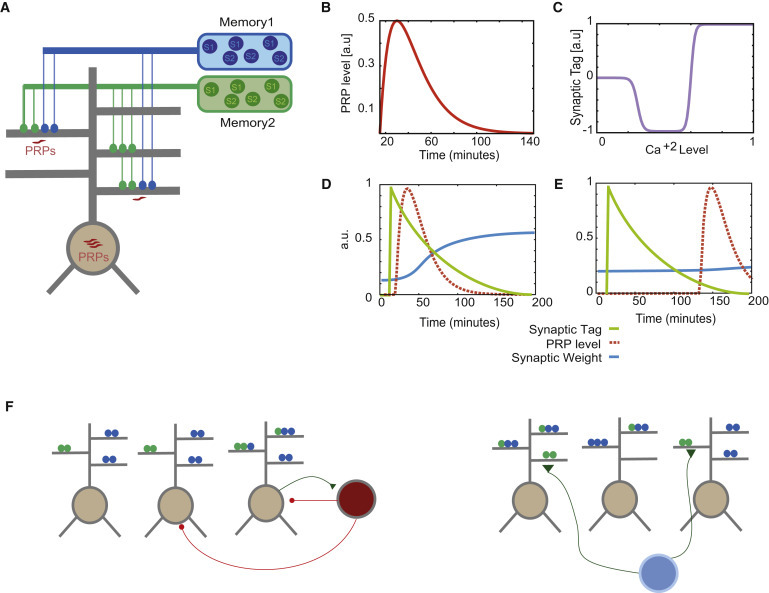 By creating a causal link between the locus of protein synthesis, dendritic nonlinearities, synapse clustering and memory engram structure, this study opens new avenues for understanding the biophysical processes underlying the formation of memory engrams in the brain. Guided by model predictions, experimental testing will shed new light into the mechanisms enabling memory interactions in health and disease."